(CNN) -- The two people who died and the 19 others who fell ill at a central Arizona resort after spending time in a sauna-like "sweatbox" were attending a program by self-help expert James Arthur Ray, authorities said Saturday. Two people died and were 19 injured after spending up to two hours inside this "sweatbox" at an Arizona resort. The dead were identified as James Shore of Milwaukee, Wisconsin, and Kirby Brown of Westtown, New York, Sheriff Lloyd Waugh told reporters. They were among the 50 or so visitors at the Angel Valley Resort near Sedona attending Ray's "Spiritual Warrior" program. Nineteen others were treated for injuries sustained in the sweatbox, a dome-like structure covered with tarps and blankets. Hot rocks and water are used to create steam in the enclosed environment. Waugh said investigators are looking into evidence that "may turn this into a criminal prosecution." Investigators are looking into similar events held previously in other locations by Ray, who refused to speak with officers at the scene, Waugh said. A follow-up interview is expected to happen. Ray's publicist, Howard Bragman, did not immediately return calls from CNN on Saturday. Ray posted a noted late Friday on his Twitter page, saying: "I'm shocked & saddened by the tragedy occurring in Sedona. My deep heartfelt condolences to family & friends of those who lost their lives." On Saturday he posted another message, saying he's "spending the weekend in prayer and meditation for all involved in this difficult time; and I ask you to join me in doing the same." The self-help guru is widely known for his programs that claim to teach individuals to create wealth through all aspects of their lives -- financially, mentally, physically and spiritually. Ray, whose company is based in Carlsbad, California, has appeared on a variety of national programs, including CNN's "Larry King Live." In that appearance, Ray was about to address 3,000 people in Phoenix, Arizona. "Well, you know, it's interesting, Larry, because any time a new idea comes to the fore, it goes through three phases. It's first ridiculed. Then it's violently opposed. And then it's finally accepted as self-evident, normally after the opposition dies." Angel Valley Resort advertises itself as "a place to relax and heal ... where powerful earth energies are present and active." It was founded in April 2002 by Michael and Amayra Hamilton, both of whom are teachers and counselors there. The resort is on 70 secluded valley acres 20 minutes from Sedona, surrounded by thousands of acres of national forest, according to the Web site. It has Internal Revenue Service nonprofit status as a religious organization, its Web site says. "There are twenty marked vortexes and angel sites to experience connection with Earth and spirit, deep relaxation, and balancing," an online brochure says. "Angel Valley offers two labyrinths and an Angel Wheel for going inward, finding answers and getting insights." No information about the sweat lodge could be found on the Web site Saturday morning, and numerous internal links were not functioning. The use of sweat lodges for spiritual and physical cleansing is a part of several Native American tribes' cultures. A traditional Native American sweat lodge is a small dome-like structure made up of willow branches carefully tied together and covered in canvas. Rocks are heated in a nearby fire pit and placed inside the lodge, and water is poured over them to create steam. 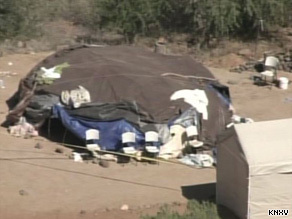 "We are curious to find out what happened there," Richard Moreno, a member of Pira Manso Pueblo tribe, told KPHO-TV. "I've been participating in the sweat lodge since the age of 3 and I've never recalled being sick from being in the sweat lodge." Moreno told the station he has never been to a lodge that held more than 20 people. CNN's Nick Valencia contributed to this report.